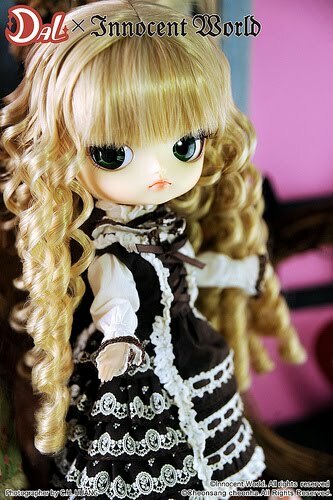 Last summer, Pullip teamed up with Angelic Pretty to make some OTT sweet and pink and ruffly dolls. 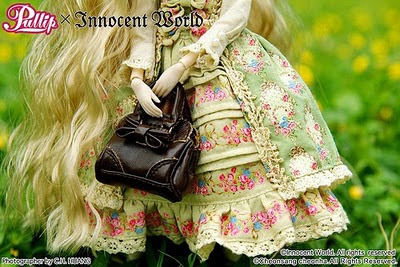 This summer, Pullip has teamed up with Innocent World. 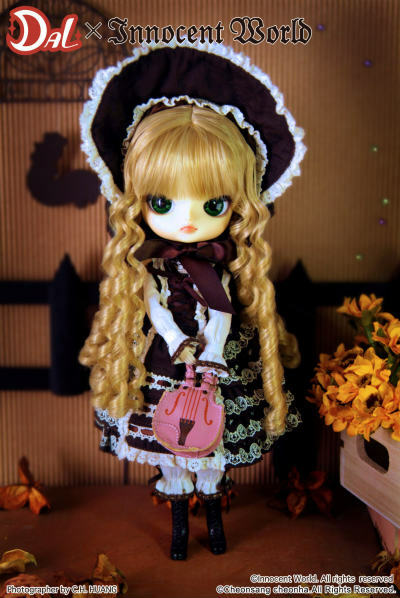 Each of the girls comes with a miniature version of an actual Innocent World dress and purse. The details are amazing! It's so cool to see famous prints shrunk down to mini size. These dolls will be released around mid July and will cost around $150. 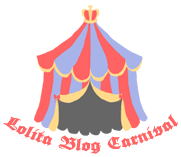 You can pre-order them directly from Innocent World or through Qcute. Now, let's have a closer look at each of these cuties! 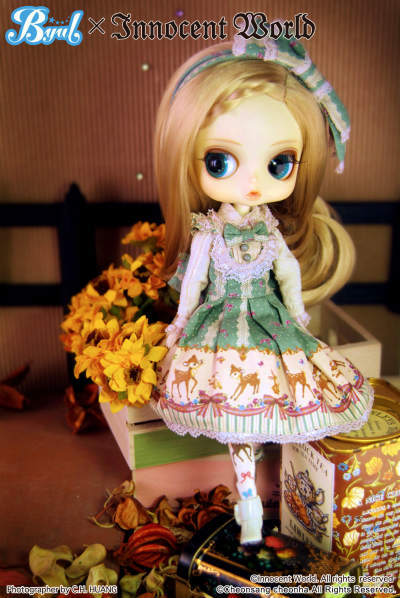 Pullip wears a classic green floral dress and over dress. 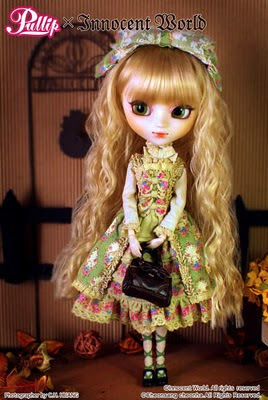 The dress is lovely and rarely seen bright green covered in decadent floral designs. Honestly, Pullip is my least favorite of the girls, her sculpt is too plain for my tastes, but her dress is probably my favorite of the three. The coat and parasol is sold separately for around $50. 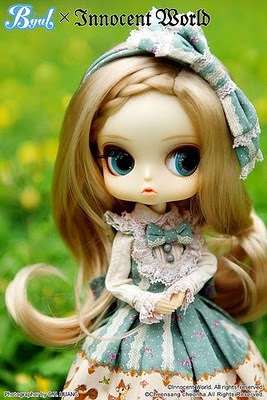 Dal is more my type of doll! She's grumpy and chubby cheeked and just too cute. 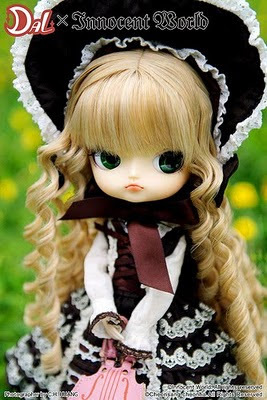 She comes dressed in a beautiful tiered dress with a matching bonnet. The lace detail on this dress is just so lovely. She carries one of Innocent Worlds famous violin purses. Dal may be a cutie but Byul is really my favorite! There's something about her sculpt that I just love, she's grumpy and sleepy and really retro looking. She has a similar look to some Blythe dolls, only she doesn't have the harshness that Blythe has that always scares me away. 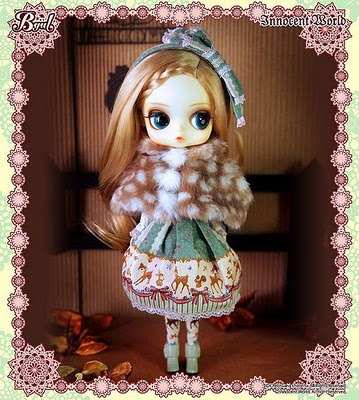 She comes with Innocent Worlds recent deer print, and a matching deer capelet. The print looks amazing so tiny, but I would honestly like it a lot more if it came in a different colorway. They are too cute for words. I think Dal is they best. I love her face. I really love them! They have beautiful, beautiful outfits. 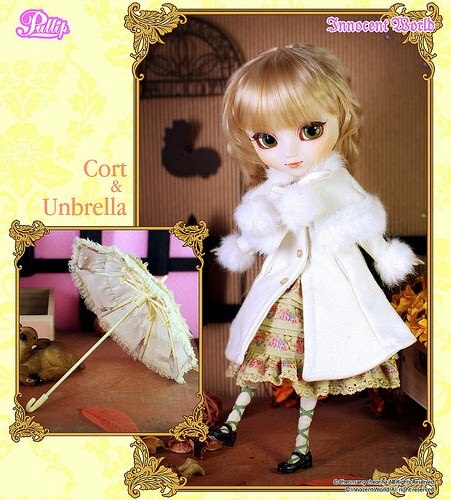 This is the first pullip collab that I feel that I really need in my life. They're so cute! I stopped collecting Pullip years ago but I might need to pick these up. I don't really get the whole doll thing, but the dresses are too cute! I've Cocotte and she is wonderful! The details of the print is perfect. AP in miniature. I would love to get one of the Innocent World dolls, as IW is my favorite brand.